SmartSpotter is part of Hamilton Bright. Read more about SmartSpotter here. Make it possible to talk about retail! Our goal is to achieve optimal synergy between retailers and suppliers, so that all the agreements between these parties can be fulfilled by 2024. All too often, agreements between retailers and suppliers are not fulfilled. This costs money and leads to frustration. 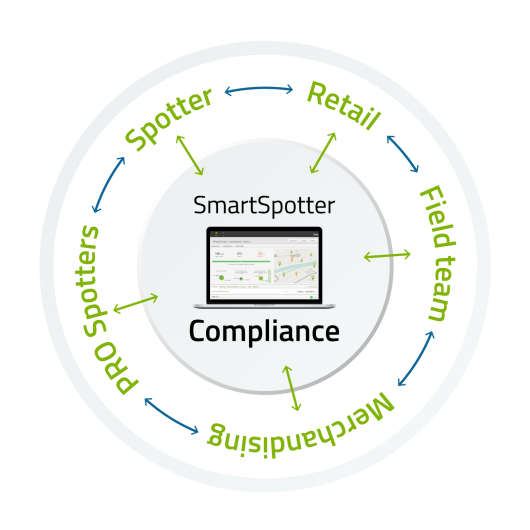 SmartSpotter solves this problem in a transparent way by reporting on execution on the shop floor. This facilitates timely intervention, and makes it possible to discuss results. The result is a better partnership between the retailer and supplier, successful store experiences for consumers and higher sales for both parties. Thousands of highly motivated users nationwide supply cost-efficient, immediately sharable data via our app, and are ready to get to work on the shop floor wherever they are needed. This allows immediate adjustments at store and head office level if the situation in store is not in line with the agreements. This is our strength. Read more about SmartSpotter here.